Steve Zahn (left) and Karl Urban will step in for Robert Duvall and Tommy Lee Jones in the last book from Lonesome Dove yarn. ***CBS finally has airdates for Commanche Moon. They ain't particularly purdy. The network has chosen Dec. 30 and Jan. 1 and 2 for the six-hour miniseries, which will have to shoot it out against high-profile college football games. 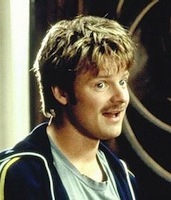 Steve Zahn (Rescue Dawn) and Karl Urban (The Lord of the Rings: The Return of the King) respectively are the new Gus McCrae and Woodrow Call. Rachel Griffiths, Val Kilmer and Wes Studi also are in the cast. The original and now legendary Lonesome Dove miniseries debuted in 1989 on CBS, with Robert Duvall and Tommy Lee Jones playing Gus and Woodrow alongside the likes of Anjelica Huston, Danny Glover, Diane Lane, Chris Cooper and Steve Buscemi. Return to Lonesome Dove, with Jon Voight stepping in for Jones, came along in 1993. Gus was dead for that one, but returned three years later in the person of David Arquette in the Dove prequel Dead Man's Walk. Jonny Lee Miller played Woodrow. A 1995 miniseries, Streets of Laredo, starred James Garner as Woodrow, with Gus again out of the picture. Lonesome Dove: The Series, which premiered in syndication in 1994, focused on Woodrow's offspring, Newt (Scott Bairstow). ***MyNetworkTV unfurls two new series Monday night (Oct. 1). Celebrity Expose (7 p.m. central) will expose celebrities. The first two are the already immensely tiresome Lindsay Lohan and Britney Spears. Following at 8 p.m. is Control Room Presents, highlighting concert performances from around the globe. Maroon 5 is up first. *** Comedy Central has picked up the cartoon series Lil' Bush for a second season of 10 episodes due next spring. The network also will bring back The Mind of Mencia for a fourth season. ***ABC's The View again is offering limited edition "pink ribbon" breast cancer awareness mugs for $24.95, with all net proceeds going to Dallas-based Susan G. Komen for the Cure. For ordering information, go here.